This discovery will help researchers understand how neurons are using environmental temperature in addition to light to regulate sleep timing in mammals, including humans. “Decades of work from recent Nobel Prize winners and many other labs have have actually worked out the details of how light is able to adjust the clock, but the details of how temperature was able to adjust the circadian clock were not well understood,” said Swathi Yadlapalli, first author of the study and a postdoctoral researcher in the U-M Department of Molecular, Cellular and Developmental Biology. As we’re coasting toward bedtime, these circadian clocks cool our internal body temperature. As we’re gliding toward wakefulness, these clocks turn up the heat. This is regardless of the temperature of the room we’re sleeping in. 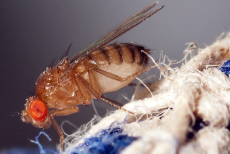 But showing that circadian clock neurons in fruit flies use external temperature to trigger sleep suggests that some clock neurons in humans could be similarly sensitive.